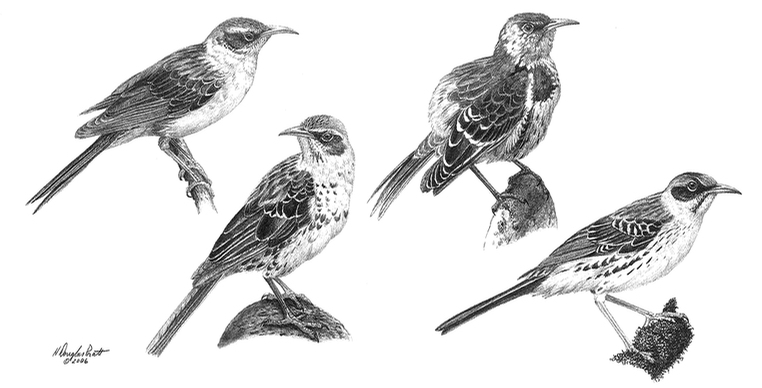 The sub-genus Nesomimus comprises the four species of Galápagos mockingbirds, all of which are endemic to the archipelago. Ridgway (1890; Proceedings of the U. S. National Museum, vol. 12, no. 767) named the genus Nesomimus = Orpheus melanotis (Gould) based on one of Darwin’s specimens. The three mockingbird species observed and collected by Darwin were originally placed in the genus Orpheus by John Gould (1837), the genus including also all of the mainland mockingbirds. Bill of moderate length or longish, rather slender, straight or slightly arched, broader than high at the base, compressed toward the end, acute; upper mandible with the ridge rather narrow, the sides convex toward the end, the notches very slight, the tip narrow; lower mandible with the angle of moderate length, the dorsal line straight or slightly decurved toward the end, the sides nearly erect, the tip narrow. Nostrils oblong, partially concealed by the feathers. Head of ordinary size, ovato-oblong; neck of moderate length; body rather slender. Feet of ordinary length, slender; tarsus scarcely so long as the middle toe and claw; hind toe of moderate length, stout, lateral toes equal; claws moderate, arched, compressed, acute. Plumage soft and blended. Bristles rather long. Wings of ordinary length, broad, rounded, the first quill very small, the fourth and fifth longest. Tail very long, straight, much rounded, or graduated. Type specimen of the genus Orpheus was Linnaeus’ original Turdus polyglottos. The type is now placed in Mimus polyglottos, the Northern Mockingbird. The genus Mimus was described by Boie (1826, Isis, p. 972). Between 1837, when Gould first described Darwin’s Beagle specimens (including the mockingbirds from Galápagos as well as those from Argentina and Chile) and 1841, when the Bird volume of the Zoology of the Voyage of the Beagle was published, Gray corrected Gould’s classification based on the priority of Mimus over Orpheus. The type specimen of Nesomimus appears to have been the bird that Darwin collected on San Cristóbal (Chatham Island; specimen 3307, N. melanotis). Originally, it was thought that Darwin’s specimen from Santiago was a co-type, also in N. melanotis. Swarth (1931) later determined that the bird on which the Gould’s original description of O. melanotis was based had been collected by Darwin on San Cristóbal, not Santiago. Swarth therefore restricted the name N. melanotis to the birds endemic to San Cristóbal. Correspondingly, Swarth assigned the birds from Santiago (including Darwin’s specimen 3350) to N. parvulus bindloei (see subspecies of M. parvulus). The taxon N. adamsi, the type specimen for which was collected by G. Baur on San Cristóbal, is no longer considered valid, following the analysis of Swarth. Based in large part on the analyses of Arbogast et al. (2006), the American Ornithologists’ Union South American Check-List committee decided ‘officially’ to merge Nesomimus, the endemic clade comprising the four traditionally recognized Galápagos mockingbirds, into Mimus (September 2007).